Whether you are looking for a boat show with new model power and sailboats, or antique wooden boats from yesteryear, there is an event going on this weekend that's right for you. You just need to find it, and that's where we come in. We've highlighted several of this weekend's boat shows below; and, as always, you are welcome to jump ahead to the First Boat boat show calendar for a quick look at the lineup of boating events this weekend and beyond. The Catawba Island Boat Show is Friday, May 4th, through Sunday, May 6th, at the Catawba Island Club, Port Clinton, Ohio. The event promises to have more than 70 boats on display, both power and sail, as well as antique boats and accessories. Across the pond and across the Channel? If you are anywhere near the Channel Islands this Saturday, Sunday, or Monday - Monday is a bank holiday in the UK - make plans to attend the Barclays Jersey Boat Show. Meanwhile, back here in the States... Detlaville, Virginia, is home to the 2nd annual Middle Bay Boat Show at Norview Marina this Saturday and Sunday with more than 30 exhibitors as well as a replica of the boat used by Captain John Smith to explore and chart the Chesapeake Bay in 1607 and 1608, on loan from the Deltaville Maritime Museum. Also on Saturday and Sunday , the NC Maritime Museum is hosting its annual Wooden Boat Show on Front Street in Beaufort, North Carolina. 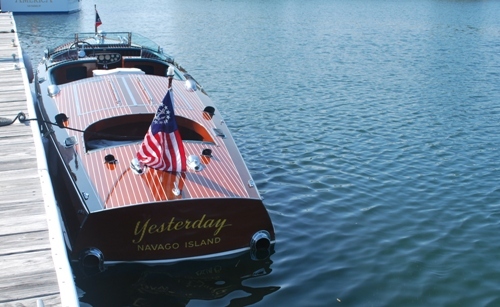 On Saturday this weekend, Wood Waves and Wheels is being hosted by the Fort Worth Boat Club located on the Eagle Mountain Lake in Fort Worth Texas. This show has become a regional favorite with beautiful vintage cars and motorcycles displayed in the shade on the lawn of the beautiful Fort Worth Boat Club over looking a marina filled with spectacular wooden boats of all kinds. Milford, Connecticut, nestled on the shoreline of Long Island Sound, is holding its first ever SailQuest - a boat show from Friday, May 18 to Sunday, May 20, 2012. More info. Related: Check out the USCG Navigation Center website at navcen.uscg.gov.